Generally speaking, there are the two primary principles of China's policy on religion, namely respecting the freedom of religion, and adhering to independence and self-governance. The current constitution stipulates: "Citizens of the People's Republic of China have freedom of religious belief; no government department, social organization, or individual may force citizens to believe or not to believe in religion, or discriminate against citizens on the basis of their belief or lack of belief in religion; the state protects normal religious activities; no one may use religion to conduct activities that destroy social order, harm citizens' health, or hinder the nation's educational system; and religious organizations and religious affairs may not be controlled by foreign powers. " In addition, Election Law, Organization Law, Autonomy Law, Organization Law of Villagers' Committee, Electoral Law of People's Congress, Education Law, Labor Law, and other laws stipulates the equal rights to people with different religious beliefs. Due to the long history and large population of China, there are many religions in this country. Among them, Buddhism, Taoism, Islam and Christianity are very popular. China's five officially sanctioned religious organizations are the Buddhist Association of China, Chinese Taoist Association, Islamic Association of China, Three-Self Patriotic Movement and Chinese Patriotic Catholic Association. Buddhism was introduced from India during Han Dynasty. The most recent surveys show the total number of Chinese Buddhists reaches to 300 million, at a growing 18% to 20% of the total population. The 108-metre-high Guanyin Statue of Hainan was enshrined on 24 April 2005 with the participation of 108 eminent monks from various Buddhist groups in Hong Kong, Macau and Mainland China, and tens of thousands of pilgrims. In 2010 remains of the skull of Gautama Buddha have been unveiled and enshrined as relics (sarira) at Qixia Temple in Nanjing. Taoism is born in China. Besides being a religion, Taoism is also considered as a thought system or philosophy. It developed gradually with the support from the rulers in different ages. Today both the Beijing Taoist Association and the Shanghai Taoist Association report their own membership to number over 100 million individuals. Christianity in China comprises Protestants, Catholics, and a few Orthodox Christians. The most recent official census enumerated 4 million Roman Catholics and 10 million ‎Protestants. You can find a church easily in almost every part of China. 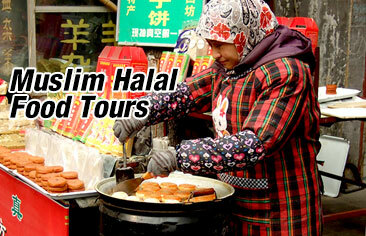 Muslims are found in every province in China. Ten groups of China's 55 officially recognized minorities are predominately Muslim. According to government figures, there are 20 million Muslims (1.4%) with 35,000 Islamic places of worship, and more than 45,000 imams. The religious concessions granted to Muslims include that: Muslim communities are allowed separate cemeteries; Muslim couples may have their marriage consecrated by an Imam; Muslim workers are permitted holidays during major religious festivals; and so forth. When insisting on the principle of independence and self-governance, Chinese religions take active communication with foreign religious bodies and personnel for contribution to the world peace and sturdy friendship between Chinese and friends from other countries. For instance, in April 2006 China organized the World Buddhist Forum. Chinese Muslims are also allowed to make the Hajj to Mecca, and more than 45,000 Chinese Muslims have done so in recent years.